Want your own Galaxy server, for free? You can easily create Galaxy servers on the NSF Jetstream cloud. Each server comes preconfigured with hundreds of tools and commonly used reference datasets. It only takes a couple of minutes to start one. Once running, you can use it or change it up any way you like. Please note that, due to some Jetstream restrictions, this is a standalone Galaxy server in the cloud - it is not a scalable virtual cluster managed by CloudMan. You must be a US-based academic to access Jetstream cloud. Access is free but it is necessary to have an XSEDE account (go to https://www.xsede.org/ to sign up) and have an active resource allocation. Getting the resource allocation is matter of writing a summary of your research and waiting for the application to get approved (typically one business day, but can take longer). Go to http://jetstream-cloud.org/allocations.php → Submit and manage allocation requests to get started; then choose Startup type allocation. See this page for more details about the request allocation process. How do I launch my own Galaxy server? Visit https://use.jetstream-cloud.org/, and log in using your university, national lab, facility, project, Google or Globus ID. Select the provider: TACC or Indiana University. Select the instance size: This must be large or larger. If you don't have any existing projects in Jetstream, the next form will prompt you to create a new project. In less than 5 minutes, you should have your own, fully configured Galaxy server - just copy the new server IP address to a new browser window. Galaxy 16.07 Standalone: this image contains Galaxy 16.07 release with a toolset that closely matches that of the public Galaxy server available at usegalaxy.org as well as a complete set of reference genomes available on that same server. Availability of the reference data was realized by enabling a connection to a (CVMFS-based) replica server that offers access to approximately 3TB of reference data (vs. ~50GB in the previous version of the image). An additional benefit of such integration is that the reference data is no longer stored on the machine image, reducing the size of that image to about 10GB, leaving more space for the analysis data. The base operating system is Ubuntu 14.04. The image was built using the cloud_setup flavor of the GalaxyKickStart Ansible playbook. Galaxy 16.01 Standalone: the initial release of Galaxy on Jetstream. This image includes Galaxy 16.01 release and comes preconfigured with numerous tools as well as about 50GB of reference data. The base operating system is Ubuntu 14.04. 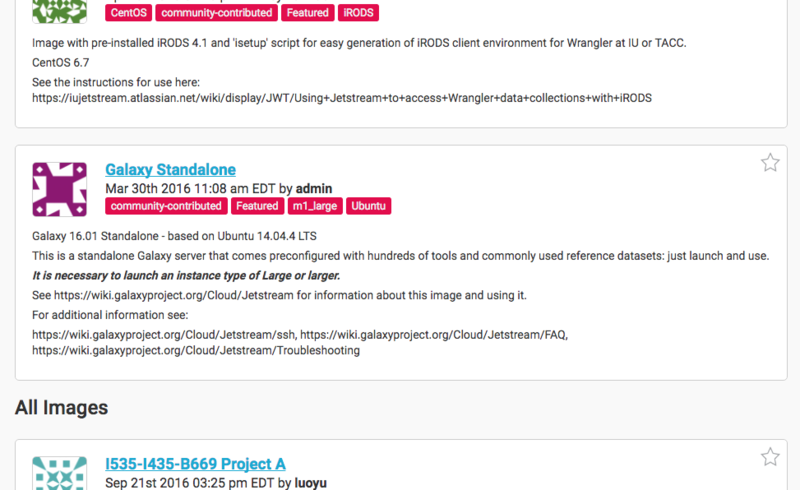 Jetstream is a US national cyberinfrastructure managed science and engineering cloud that offers researchers access to flexible computational resources. Researchers are able to create virtual machines (VM) and virtual disks on the remote resource that look and feel like their lab workstation or home machine, but come preconfigured with dozens of software tools and/or can dynamically scale to accommodate variable computational demand. Access to Jetstream is awarded as a merit-based allocation via XSEDE free of charge. Jetstream is supported by National Science Foundation award ACI-1445604: 'Jetstream - A Self-Provisioned, Scalable Science and Engineering Cloud Environment’. More information about the project is available at http://jetstream-cloud.org/. When you choose your instance size, keep in mind that you will burn as many Service Units (SUs) (also known as Allocation Units, or AUs) per hour as the number of cores your instance has. For example, if you have a 4 core instance, you will burn 4 SUs per hour. While your instances are stopped or deleted, you are not consuming any SUs. More information about the instance types and usage modes is available on the Jetstream site (http://jetstream-cloud.org/general-vms.php). Cloud Virtual Machines (VMs) are typically transient in nature. This means that once you delete (i.e., terminate) an instance, it is permanently gone, including any configuration changes and the data. So, before you delete an instance, it is necessary to download any data you wish to keep. To delete an instance, click the Delete button. On Jetstream, you can stop a VM without deleting it. This will preserve any data and configuration changes you have made to your server while it was running. When you want to use the server again, just Start it and wait for it to come back up. While a VM is stopped, no SUs are being used. To stop a VM, click the Stop button. If Galaxy jobs fail after you have Started the server, reboot the server. Volume storage provides persistent storage in the cloud. Volumes can also be used to expand the size of disk storage otherwise available on your server. Volumes are seen as external disks that can be attached to different VMs, but only one VM at a time. Once created and attached, it is necessary to create a file system on the disk and mount it. From there on, data can be stored on the volume just like anywhere else on the VM. Before terminating a VM, it is necessary to unmount the volume file system and detach it from the VM. When another VM is launched, the same volume can just be attached and the file system mounted (notice that a file system is not created as it was the first time). The same data that was available on the first VM will be available again. Note that by default Galaxy will not aware of such external volume and hence data stored on the volume will be independent of Galaxy.